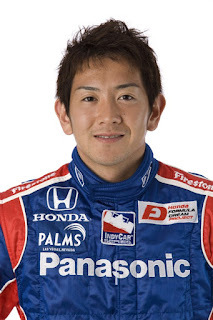 Evicted from the team now known as Andretti Autosport after 2009, Japanese Hideki Mutoh joins the Newman/Haas/Lanigan race team for what will be his third full season in the IZOD IndyCar Series. Announced on Sunday, this recent confirmation by autosport.com corresponds with lingering speculation for where Mutoh would run in the upcoming open wheel season. The 2008 IndyCar Series Rookie of the Year, Hideki Mutoh's North American career started in the Firestone Indy Lights Series in 2007. Winning the sprint race at Kentucky Speedway, Mutoh finished 2nd overall in the Indy Lights championship standings. Later in that season Mutoh was supplied one-off appearance in Panther Racing's #60 car at Chicagoland Speedway IndyCar event. An strong 8th place debut outing saw the Japanese driver services secured by Andretti-Green Racing for the past two IndyCar seasons. In Mutoh's short career of 35 starts, his best finish came in his rookie year with a 2nd on the short track of Iowa Speedway. Last year, Mutoh's return to the Iowa track amounted in a season best 3rd place with his #27 Andretti-Green Racing car. Despite some top 5 runs, Hideki Mutoh finished just outside of the top 10 in overall 2009 IndyCar Series points. With the start of the 2010 IZOD IndyCar Series only three weeks away, there continues to be apparent vacancies in the team rosters for several teams including Dale Coyne Racing and KV Racing Technology. Even the driving lineup of Newman/Haas/Lanigan Racing hasn't been completely ironed out with Mutoh being the team's only official driver for 2010. Second-generation driver Graham Rahal tenure with the team seems all but over as the off-season placed Rahal with various other IndyCar teams. Alex Lloyd has long been hinted for a ride with the team. Rumours have also mentioned that Newman/Haas/Lanigan Racing's Champ Car championship driver Sebestian Bourdais could return as part of the 2010 campaign. It's also unconfirmed if 2 or 3 cars are going to be run by Newman/Haas/Lanigan Racing even as opening round on the street course of Sao Paulo, Brazil nears. Mutoh becomes the 2nd confirmed Japanese driver for the 2010 IZOD IndyCar Series this week following the migration of former F1 star Takuma Sato signing with one of KV Racing Technology's teams just a few days ago.